While working in my ministry office recently, I noticed two squirrels feverishly surveying nearly every inch of my front yard in what seemed to be a strategic search for those precious pecans which they had buried in various locations deep within the soil last fall. As I paused from my ministry work for a few moments, I pondered over their diligence in seeking after their buried “food treasures.” I felt the Lord speak to my heart regarding the vivid witness to which these two small creatures were demonstrating – that of the vital need for believers to diligently search for the hidden truths of God which He purposefully has buried deep within the pages of His Holy Word. 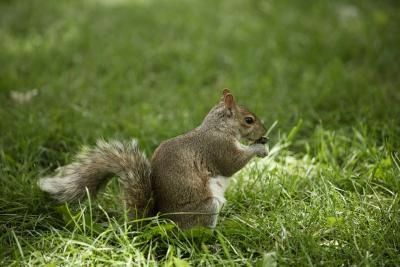 These eternal treasures of God are only discovered by digging, seeking and probing deep into the spiritual soil of the scriptures, much like those two squirrels demonstrated. Many people today seem to easily accept the superficial (shallow) findings (i.e. “manna nuggets”) that lay on the surface and require little to no digging (i.e. minimal personal effort / commitment / discipline). Jeremiah 29:13 declares that our treasure hunt throughout the terrain of His living Word demands our all - “You will seek Me and find Me when you search Me with all your heart (‘wholeheartedly’ NLT).” Colossians 2:3 HCSB teaches us that “all the treasures of [‘divine’ Amplified Bible] wisdom (‘comprehensive insight into the ways and purposes of God’ Amplified Bible) and knowledge are hidden in Him (Jesus Christ).” Our quest to gather these precious gems of spiritual truth cannot be accomplished by our own efforts. Only through the revelatory leading of the Holy Spirit in our hearts and minds can we discover these hidden kingdom treasures. As Jesus said, the Holy Spirit is the One who “will guide you into all truth. He will not speak on His own; He will speak only what He hears, and He will tell you what is yet to come. He will bring glory to Me by taking from what is mine and making it known to you” (John 16.13-14). As genuine believers we should have an insatiable desire to dig deeper in our personal faith journey to uncover the many riches of Christ which await us. Our search should always be conducted with the expectancy of discovering the ultimate treasure – that of the living presence of Jesus Christ Himself. Proverbs 2:1-6 NLT declares, “My child, listen to what I say, and treasure My commands. Tune your ears to wisdom, and concentrate on understanding. Cry out for insight, and ask for understanding. Search for them as you would for silver; seek them like hidden treasures. Then you will understand what it means to fear the Lord, and you will gain knowledge of God. For the Lord grants wisdom! From His mouth come knowledge and understanding.” What great joy arises when our search uncovers these kingdom riches that deepen our faith in Christ and strengthen our hearts for the journey ahead. Psalms 119:162 NLT affirms this spiritual elation as the psalmist pens, “I rejoice in Your Word as one who discovers (‘finds’ NKJV) a great treasure.” Despite God’s clear instruction for diligence in our daily treasure hunts, many today read the Word of God hurriedly or carelessly – if they even read it at all – and because of such flippancy, they miss much of its deep, divine insights which our souls so desperately need for the spiritual fuel necessary for our daily spiritual travels day. The kingdom’s truths (treasures) are purposefully difficult to find for the careless, indifferent (prideful) and insincere treasure hunters. Matthew 11:25 Amplified Bible states it this way, “You have hidden these things from the wise and clever and learned, and revealed them to babies [to the childlike, untaught, and unskilled].” But to those whose hearts are sincere (i.e. pure / childlike) in discovering these treasured truths come the Lord’s promise for our uncovering of an limitless bounty of kingdom treasures/riches. Sadly, many in today’s fast paced, busy culture have succumbed to the enemy’s all too common lie that we don’t have sufficient time to spend in His Word. Even if we do have an extra few moments in our hurried day for God’s Word, then it seems to be relegated to that of being a mere line item on our “to-do” list and treated as just another task for us to “check off” as if we somehow please the Lord by sharing a few extra “time giblets” with Him. The busyness factor of today’s culture seems to feed this shallow surface-skimming mentality evidenced by such things as 30-second devotional thoughts on the radio / internet, 20 minutes sermons in churches throughout our land and spiritually shallow resources like the One Minute Bible® which contribute to the spiritual anemia that has infected the hearts of many who launch into each new day’s journey without sufficient spiritual nourishment (i.e. time in His Word). Like many who skip breakfast thinking they will save a few minutes, choosing to skip the daily time of manna excavation will only yield us empty treasure chests. Such neglect / irreverence to the Word of God will surely lead to a time in the coming days “when (He) will send a famine on the land—not a famine of bread or water but of hearing the words of the Lord.” (Amos 8:11 NLT) When this prophesied famine strikes, many who have chosen to only skim the surface (i.e. stay shallow in their Bible studies) in lieu of digging deeper into the truths of God will “hear but never grasp and understand; and (they) shall indeed look and look (i.e. search) but never see (hidden treasures) and perceive (understand His truth).” (Matthew 13:14 Amplified Bible / Acts 28:26 CEV) So where does your heart in the divine quest for hidden kingdom treasure lay today? My prayer is that we all seek to dig deeper into the strata of God’s Holy Word in an unending pursuit to better know Christ so that we can be more effective making Him known to the world around us. Allow this Easter season to be a time for renewal, restoration and revival as you dig deeper in your unending quest for becoming more like Jesus! …Selah! Today's Spirit-led video is "Treasure of Jesus" by CCM artist Stephen Curtis Chapman.